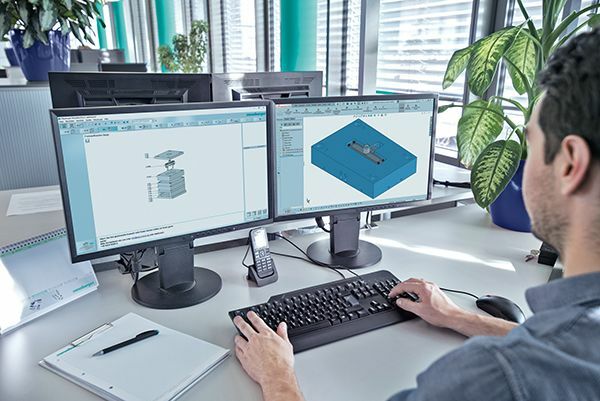 With the brand new Meusburger configurator for hot runner moulds, a complete mould base including hot runner manifold can be customised with just a few clicks. The configurator offers the highest flexibility, immediate creation of the 3D data and quick price display. This world first on the market is the result of the very good cooperation between Meusburger and PSG. The new configurator for exclusive hot runner moulds from Meusburger offers the possibility of selecting the hot runner manifold as well as the flexible positioning of the nozzles and the entire manifold in the manifold plate. The thickness of the FH 63 Manifold plate and the nozzle length are automatically calculated on the basis of the various parameters entered in the configurator. The dynamic display of the mould size optimally shows the manifold plate relative to the manifold. In case of doubt, the next larger or smaller plate is selected. After the configuration of the temperature regulation system, you can finally choose the material of the manifold plate and the rest of the plates required to complete your mould base. During configuration, there is a live display of the manifold. This way individual adjustments can be tracked and edited directly on the screen. At the end of the process, the 3D data is created immediately and is available to the customer for download right away. Another advantage is the immediate price calculation. The designer can concentrate on other matters during the mould design and thus saves valuable time. In addition to the hot runner mould, the required components and the right accessories can also be ordered directly from Meusburger. This way the customer receives everything from just one source and with only one order. The individually selected components of the hot runner mould are delivered promptly and in the usual high quality. The customer receives a fully assembled hot runner manifold. However the mould base for the hot runner mould is not pre-assembled. This saves having to take it apart and means that the components are immediately ready for subsequent machining. “Following the takeover of PSG in 2016, this is a further step towards standardisation in the hot runner sector. There is very good cooperation within the Meusburger Group, has resulted in an expansion of project-related business,” said managing director Guntram Meusburger of the launch of the new product group.